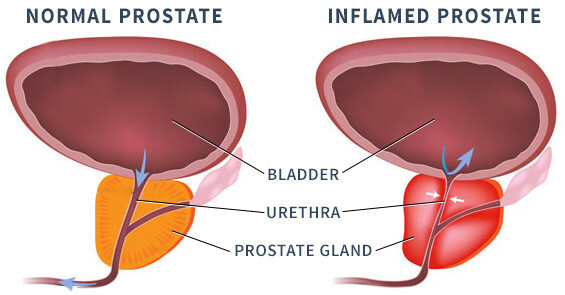 Prostatitis is an inflammation or swelling of the prostate gland. It may be caused by an infection, but sometimes the usual diagnostic tests are unable to identify a specific organism. This is a problem looking for a solution, especially if the condition is chronic (repeatedly comes back). Prostatitis can defy accurate diagnosis. It overlaps with other prostate conditions. One of the most common tests, a basic urinalysis, fails to detect 85% of bacteria strains that can cause prostatitis. In standard practice, a doctor takes a detailed description of symptoms and any other problems going on at the same time. Lab analysis includes urine, blood, and prostate fluid. A digital rectal exam is performed, though this only examines one surface of the gland. A physical urological exam may also be done. If results are inconclusive, a diagnosis of Chronic Pelvic Pain Syndrome (CPPS) is often assigned, especially if pain or urinary symptoms have been present for 3 of the previous 6 months. Finally, if PSA is elevated, a biopsy may be ordered to rule out prostate cancer. Acute bacterial prostatitis comes on gradually or suddenly. It is caused by a bacterial infection. A complete course of appropriate antibiotics generally clears it up. Chronic bacterial prostatitis either lingers on or comes and goes in cycles because antibiotics did not get rid of all the bacteria. It may be difficult to treat because of drug-resistant bacterial strains. Chronic prostatitis with no sign of infection has the same characteristics as chronic bacterial prostatitis but no infection is found. It is the most difficult to diagnose accurately. Antibiotic treatment is not effective. In some cases, the problem may actually be Chronic Pelvic Pain Syndrome, or CPPS, a condition caused by tense pelvic floor muscles. Asymptomatic prostatitis does not have any symptoms, but is detected while diagnosing other health issues in the pelvic area. A doctor can determine if treatment is necessary. New hope: A 3T multiparametric MRI before a biopsy helps correct diagnosis. Thanks to our pioneering use of 3T mpMRI – BlueLaser™, the Sperling Prostate Center is a recognized leader in identifying prostate diseases. Our 3T mpMRI – BlueLaser™ is superior to CT and ultrasound in defining abnormal tissue in the prostate and its surroundings. When interpreted by our expert readers, it reveals prostate abnormalities that distinguish prostatitis from benign prostatic hyperplasia (BPH) or prostate cancer. The type of imaging we offer using our powerful, state-of-the-art MRI uses specialized sequences, or parameters, that reveal distinctive characteristics of prostatitis such as cellular differences, and blood flow that distinguishes inflammation vs. prostate cancer. During a scan for prostatitis, if an area is detected that is suspicious for prostate cancer, a targeted in-bore mpMRI-guided biopsy using minimal needles can be done to rule out prostate cancer. Note: Discomfort can be linked with bowel problems, so if you’re prone to bowel irritation, avoid foods that cause it. Note: There is nearly universal agreement on the information below, though research into supplements produces sometimes conflicting results. Always discuss supplements with your doctor before using. Supplements with a mixture of herbs or active ingredients. It’s best to try a single ingredient at a time to see if it works for you. Many cases are caused by a bacterial infection, and should be treated with antibiotics to avoid worsening. Symptoms that mimic prostatitis can also be caused by injury to the groin area, or nervous condition. When standard tests fail to determine a specific source of infection, the Sperling Prostate Center offers a new advanced urine test that picks up organisms missed by other tests. ▾ I've had intermittent lower pelvic pain, which my doctor diagnosed as prostatitis, but antibiotics didn't work. Now he says I might have CPPS. What is that? CPPS is short for Chronic Pelvic Pain Syndrome. Prostatitis is often associated with CPPS, even though prostatitis may not be the culprit. CPPS is harder to get a handle on than prostatitis. In fact, the patient may be experiencing nerve pain resulting from tension in the pelvic floor—but the source of nerve pain can be elusive since the pain may be referred (arises in a different place from where it is felt). Only a doctor can diagnose your unique situation. Consider finding someone in your area who specializes in CPPS for a second opinion. ▾ Is there a better way to tell whether it's prostatitis or CPPS? This system guides the diagnostic process and allows treatment to be tailored to the individual. In addition, we strongly recommend a baseline multiparametric MRI (mpMRI) as soon as possible to visually identify and characterize the prostate and surrounding tissues. We are proud to offer 3T mpMRI – BlueLaser™ at the Sperling Prostate Center to help screen for a variety of prostate conditions. Our unparalleled imaging and expert readers can detect even subtle tissue changes that indicate prostatitis-related inflammation, making it a superior diagnostic tool for those who may be suffering from prostatitis. Are you worried about prostatitis? Schedule a free consultation with Dr. Sperling to map out a diagnosis and treatment plan all personalized for your unique circumstances.